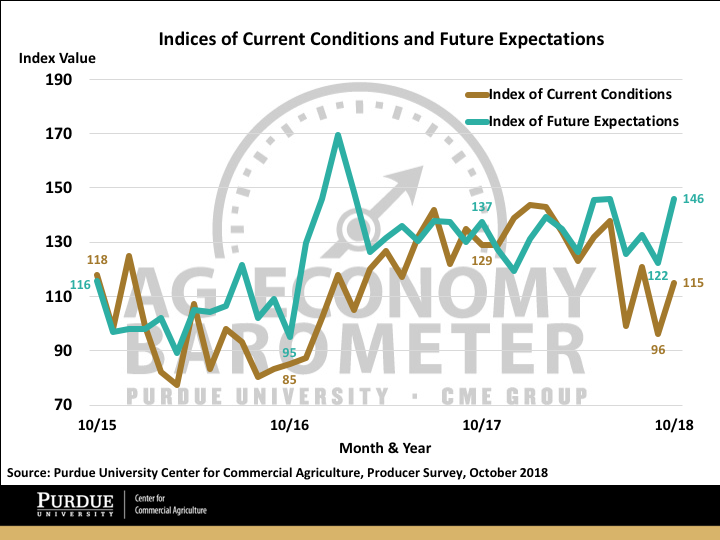 The Purdue University/CME Group Ag Economy Barometer rebounded in October to a reading of 136-a 22-point increase in the index compared to September-leaving the barometer nearly equal to its level one year ago. This month's recovery in the barometer was underpinned by improved perceptions of both current conditions and future expectations as the Index of Current Conditions rose 19 points to a reading of 115 and the Index of Future Expectations rose 24 points to a reading of 146. Month-to-month shifts in barometer readings continue to be quite large as U.S. agricultural producers are buffeted by shifts in major commodity prices and news about trade negotiations with key ag trade partners. Figure 1. 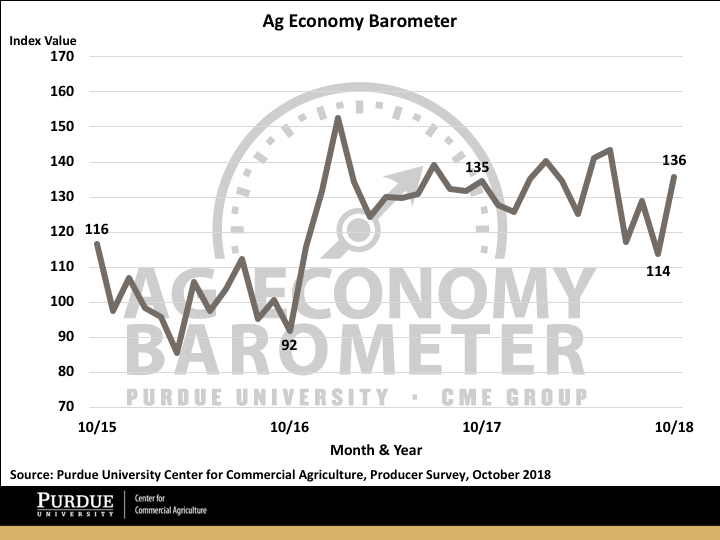 Purdue/CME Group Ag Economy Barometer, October 2015-October 2018. 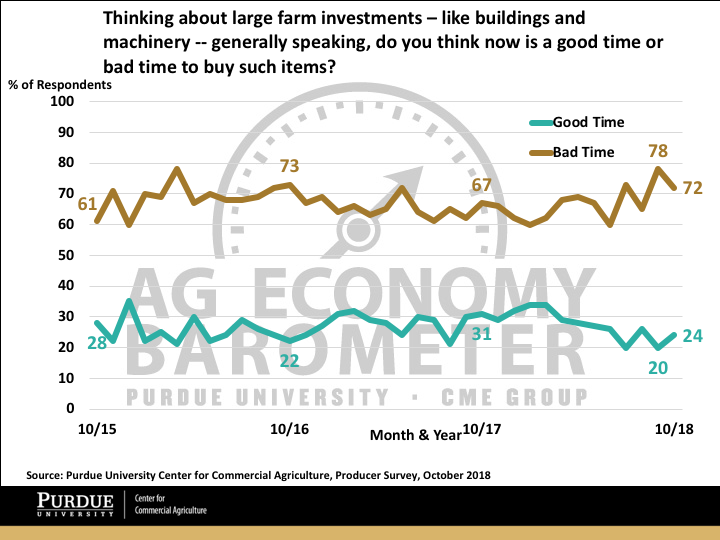 Although both current sentiment and future expectations rose in October, it is a relatively positive view of the future that is really underpinning the Ag Economy Barometer. This month's Index of Future Expectations reading of 146 pushed the index back to the peak attained this past spring before the ag trade conflict with China erupted. In contrast the Index of Current Conditions, even with this month's rebound, remains well below the levels recorded in winter and spring 2018. Figure 2. Indices of Current Conditions and Future Expectations, October 2015-October 2018. Some of the optimism about the future was probably attributable to producers' relatively optimistic perspectives regarding the future direction of crop prices. In October we asked producers about their expectations for corn, soybean, wheat, and cotton prices, looking ahead 12 months. 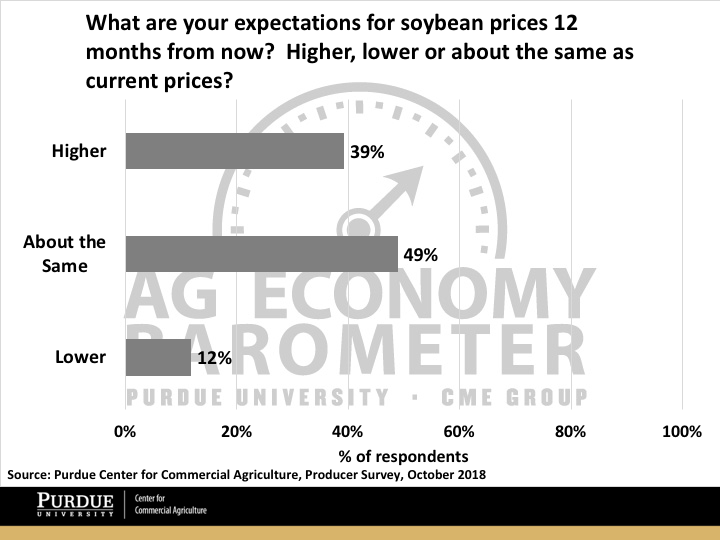 In each case, more producers said they expect to see higher prices than lower prices and for corn, soybeans, and wheat, the ratio of producers expecting higher prices to those expecting lower prices was just over 3 to 1. For example, 34 percent of producers said they expect to see higher corn prices, while just 11 percent said they expect lower corn prices. Results were similar for soybean and wheat with 39 percent expecting higher soybean prices and 34 percent expecting higher wheat prices, while just 12 and 10 percent expect lower soybean and wheat prices, respectively. Producers were less optimistic about cotton prices with just 23 percent of respondents saying they expect to see higher prices, whereas 10 percent expect to see lower prices. Figure 3. Expectations for soybean prices 12 months from now, October 2018. In early October, the Trump Administration announced that a new trade agreement, referred to as the U.S.-Mexico-Canada Agreement, had been reached. Although the trade agreement will not actually go into effect until the U.S. Congress and legislatures in both Mexico and Canada approve it, we wanted to learn how producers viewed the pending agreement. On the October survey, we asked producers to what extent the agreement relieved their concerns about farm income in the upcoming year. Results were mixed. Over 60 percent of producers said the agreement at least somewhat relieved their farm income concerns, whereas 25 percent of producers said it did not relieve any of their concerns. Figure 4. 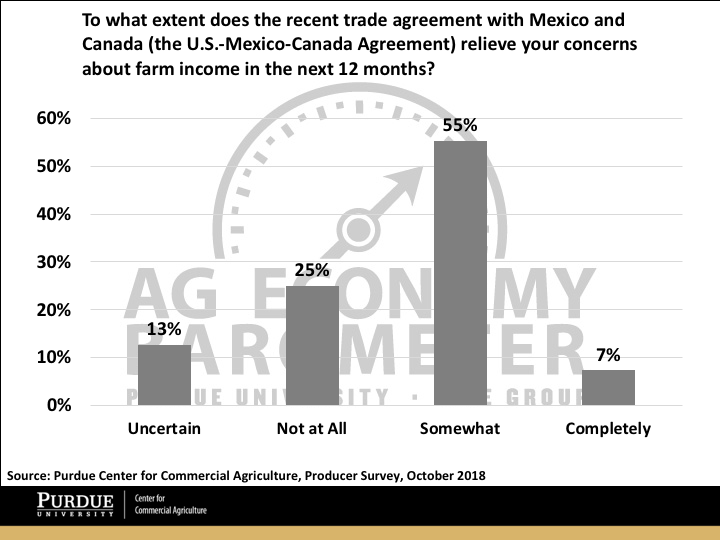 Extent to which the recent trade agreement with Mexico and Canada relieved farm income concerns, October 2018. Ag producers' views with respect to making farm investments improved in October, but producers remain cautious about making large investments in their farming operations. The percentage of producers indicating now is a bad time to make large investments declined modestly to 72 in October, down from 78 a month earlier, while the percentage that said now is a good time to make large investments rose to 24 from 20 in September. Combining these two responses into a diffusion index that characterizes farmers' perspectives on making investments in farm machinery and buildings yielded a reading of 52 in October, up 10 points compared to September, but still well below readings from last winter and spring, which were in the 60s and low 70s. Figure 5. Good or bad time to make large investments, October 2015-October 2018. The percentage of respondents expecting lower farmland values in the year ahead declined to 17 percent in October, 15 points lower than a month earlier. There were also fewer respondents expecting higher farmland prices in the next 12 months as that percentage fell to 12 percent in October from 16 percent in September. Interestingly the reduction in the percentage of farmers expecting higher farmland values was even more noticeable when the same question was posed over a 5-year, instead of 12-month, time frame. Looking ahead 5 years, just 21 percent of respondents said they expected farmland values to rise. This was a 25-point drop compared to a month earlier and was the lowest percentage of respondents expecting farmland values to rise 5 years out since we first posed this question in May 2017. Figure 6. 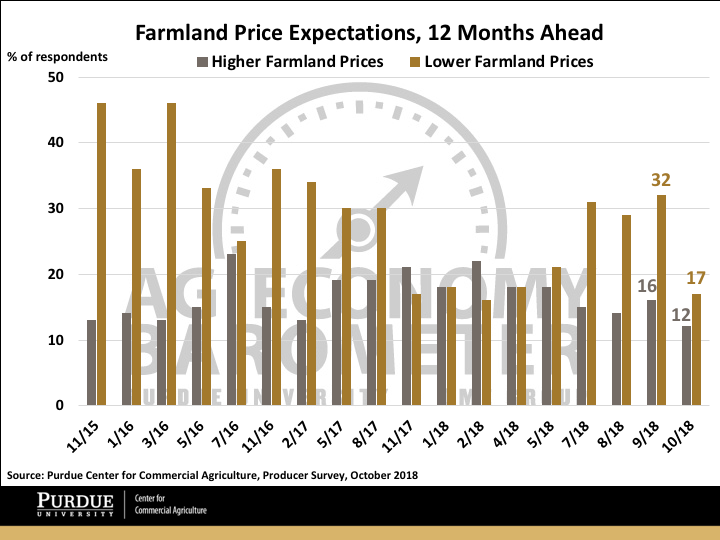 Farmland price expectations 12 months ahead, November 2015-October 2018. Given the large decline in soybean prices that took place this year, there is a lot of interest in how farmers will respond in 2019. In October we asked producers about their initial 2019 soybean planting intentions. Among growers that planted soybeans in 2018, nearly one out of five (19 percent) said they expect to reduce their soybean acreage in 2019, while the majority (77 percent) of farmers said they would hold their acreage constant. For those who indicated plans to reduce their soybean acreage, we also asked how large of a decrease they are planning for 2019. 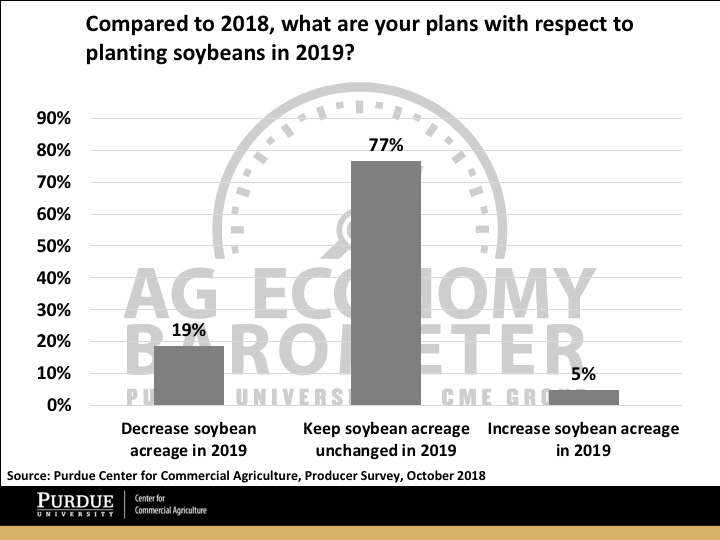 Two-thirds of the respondents said they planned to reduce their 2019 soybean acreage by more than 10 percent and 27 percent said they plan to reduce their soybean acreage by 5 to 10 percent, both compared to their 2018 acreage. Figure 7. Plans with respect to 2019 soybean acreage, October 2018. The October reading of the Ag Economy Barometer rose 24 points compared to September as farmers' perspectives on future and current conditions improved. However, producers' perspectives on current economic conditions remains much weaker than it was early this year, before major trade conflicts erupted. In contrast, producers had a much more positive view of the future than they did this summer as the Index of Future Expectations climbed back to a level last seen in spring 2018, before commodity prices weakened substantially. Producers sanguine view of the future was at least partially motivated by expectations that crop prices a year from now would be higher than they are now. Producers' attitudes about making large farm investments improved during October, but they remain cautious about making large investments when compared to their attitudes last winter and spring. Farmers were less pessimistic in October about the short-run outlook for farmland values as the percentage of respondents expecting lower values 12 months out declined. However, fewer farmers said they expect to see higher farmland values 12 months from now and there was an even sharper drop in the percentage of producers who said they expect to see higher farmland values five years from now. Looking ahead to early 2019 planting intentions, nearly one out of five farmers who grew soybeans in 2018 said they plan to reduce their soybean acreage next year. Among those who plan to reduce their acreage, two-thirds said they plan to reduce their soybean acreage by more than 10 percent.